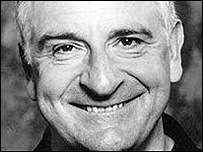 The late Douglas Adams, creator of the Hitchhiker's Guide to the Galaxy, will be heard in the first new radio adaptation of his work in 25 years. He recorded the part of Agrajag in his home studio 18 months before he died in 2001, aged 49. Digital technology will be used to include his voice in a 14-part adaptation of the final three Hitchhiker books on BBC Radio 4. The story began as a radio broadcast in 1978 before becoming a series of books. The 14-part dramatisation will be based on the final three books: Life, The Universe and Everything; So Long and Thanks For All the Fish; and Mostly Harmless. Five of the original radio cast are taking part in the new series, including Simon Jones as Arthur Dent and Geoffrey McGivern as his alien travelling companion Ford Prefect. Dirk Maggs, who adapted and directed the series, described how Adams had always wanted to play the role of Agrajag. "I used to go to his house and talk about music or Hitchhikers. "One day, he said: 'I want you to listen to something' and he put on this cassette of him playing Agrajag in Life, The Universe and Everything. "He asked me 'who do you think should be playing the character?' and I thought, I'm on a hiding to nothing here. "I thought he wanted to hear me say John Cleese, but he said 'no, you idiot, it should be me'." The creators used the author's instructions and notes in preparation for the latest radio production. Bruce Hyman, the series executive producer, said today: "It is ironic that Douglas plays someone who keeps getting killed but is reincarnated." "It's a part he always wanted to play. He loved the character." A film of the book is currently in the pipeline, starring Love Actually star Bill Nighy and Martin Freeman from TV's The Office. Adams had been working on a film version for more than a decade, but it had never got past the planning stage. The five books in the Hitchhiker series detail the adventures of Earthman Arthur Dent, who hitches a lift on a passing starship when his home planet was destroyed to make way for an interstellar bypass. In the book, The Guide is a portable device that can tell you anything you want to know about wherever you are.